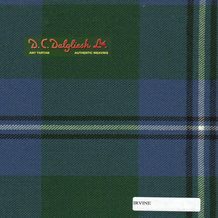 Ancient tartan colours are lighter in tone, as if aged by years of exposure to light, though ironically a relatively recent invention. In the 1950s weavers began to create lighter toned variants once the novelty of strongly toned 'Modern' dyestuffs was starting to ebb, and a fashion re-emerged for older-looking colours. The lighter tones often make a tartan's sett (pattern) easier to distinguish than in Modern colours. We can also create a new palette varient to your own specification, using any shades from our stock yarns, or by dyeing to order to match your needs. Please enquire.